Two awesome words: Compound Interest. It may sound like an intimidating term, but it really isn’t once you know what it means. It simply means that when you invest your money, not only will you earn money on what you have saved, but you also earn money on the interest you received on that money (assuming you leave it alone). So basically, it allows you to turn your money into, well, more money! It’s free money. However, it’s also patience, commitment and sacrifice of your cash flow in the present time. We all hope that one day we will just strike it rich quick by winning the lottery or winning big on Deal or No Deal, but that’s not a for sure thing. In fact the odds of this happening to you are literally astronomical. According to figures from the National Weather Service, you’re over 20,000 times more likely to be struck by lightning at some point in your lifetime than you are to win the Mega Millions Jackpot. An alternative to getting rich quick, is the slow and steady pace of investing using that nifty term; compound interest. Sure you’ll have to shell out some of your cash now, but wait until you see how the race finishes up! 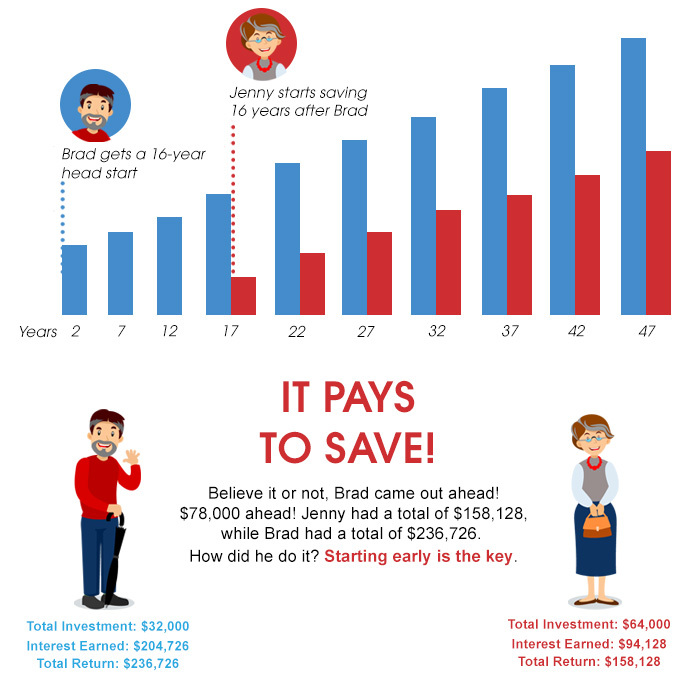 Check out this story of Brad and Jenny to understand the power of compound interest. Brad and Jenny were friends who grew up together. They both knew that they needed to start thinking about the future. At age 18, Brad decided to invest $2,000 every year for sixteen years. He picked investment funds that averaged a 5% annual return. Then, at age 34, Brad stopped putting money into his investments. So he put a total of $32,000 into his investment funds. From there, he decided to let the money sit and not add or take any from it. Now Jenny didn’t start investing until age 34. Just like Brad, she put $2,000 into her investment funds every year until she turned 65. She got the same 5% interest rate as Brad, but she invested 16 more years than he did. So Jenny invested a total of $64,000 over 31 years. Believe it or not, Brad came out ahead … $78,000 ahead! Jenny had a total of $158,128, while Brad had a total of $236,726. How did he do it? Starting early is the key. He put in less money but started sixteen years earlier. That’s compound interest for you! It turns $32,000 into over $236,000! Since Brad invested earlier, the interest kicked in sooner. The trick is to start as soon as possible. The younger you are, the more time you have on your side. But this is also a catch-22. The younger you are, the less likely you are to see the big picture of your life and your personal finances. A survey by Charles Schwab found that 24% of teens believe that since they are young, saving money isn’t important. Looks like we just blew that theory out of the water! Talk with your parents and teachers about investing for your future. And remember… slow and steady wins the race and counting on striking it rich quick will leave you in the dust! What is compound interest? Compound interest means earning interest on your interest. It’s essentially free money. Let’s take a look at the power of compound interest. Meet Brad. Brad started saving money when he was 18 years old. He saved $2,000 a year for 16 years and then stopped. This means Brad put a total of $32,000 of his own money into his investment account. From there, he decided to let the money sit and not add any more to it. Now let’s meet Jenny. Jenny didn’t start saving money until age 34. She also saved $2,000 a year. However, unlike Brad, she continued to save every year through age 65. For a total contribution of $64,000 of her own money into her investment account. 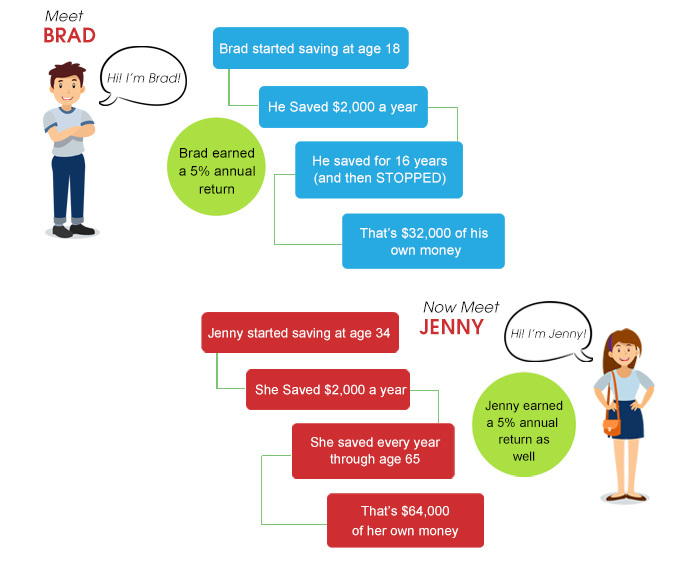 During this time both Brad and Jenny earned a 5% annual return. Now lets fast forward to age 65. Whose investment do you think is worth more? Brad, with his total of $32,000 invested over 16 years, or Jenny, who invested $64,000 over 32 years? Over time, compound interest accelerates your savings. Believe it or not, Brad came out ahead… over $78,000 ahead. Starting early is key! Brad put less money in but started 16 years earlier. Since he invested earlier, the interest kicked in sooner. It turned his $32,000 into over $236,000 and he didn’t have to do a thing! Saving a little now means earning a lot more interest later. Start saving today!